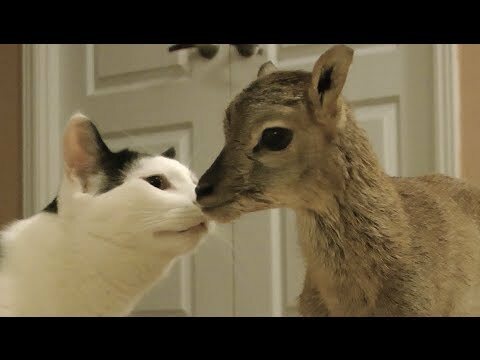 There are 1 cat videos tagged with lamb. As if Sugar Tree isn’t enough to handle, Pancake is now having to deal with a baby lamb. Both Sugar Tree, a doberman, and Pancakes the cat don’t know what to make of this new animal in their house. But neither does the lamb. Skittishly curious about both of his new playmates, this lamb does quite a bit of investigating when tailing Pancake. The lamb’s a little scared of Sugar Tree, a dog twice the lamb’s size, and quickly finds how just how sweet Sugar Tree is. The two of them chase each other for a bit before the lamb goes back to following Pancake around the house.